My last pudding recipe was a chocolate chia pudding. Just like the chocolate pudding this recipe calls for very little ingredients. However it houses a big punch when it comes to nutrients. 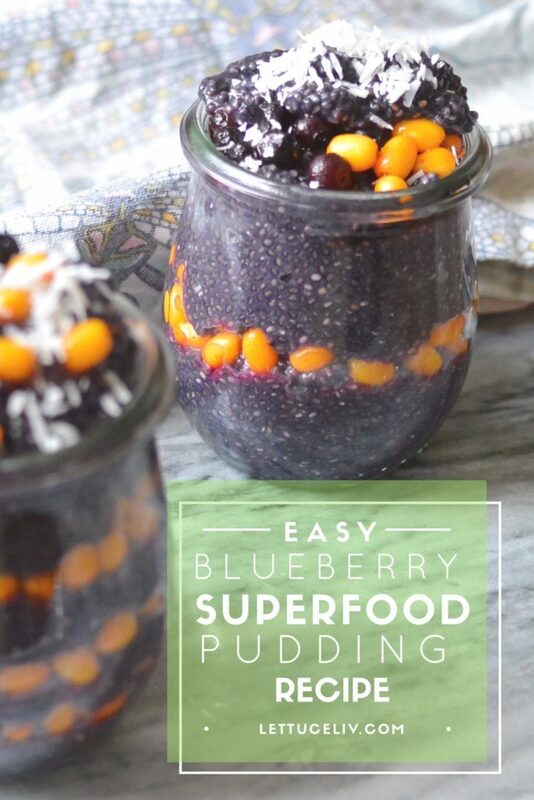 My super food pudding was made with antioxidant rich blueberries. Mineral and protein dense chia seeds. Creamy cashew milk which boast almost 50% of your daily vitamin E intake. And just a bit of B vitamin rich maple syrup or metabolism booster Yacon syrup just to sweeten the deal! Finally the shinning star in this superfood pudding is actually not the blueberries but another berry called sea buckthorn berries. Omega-7 is a rare type of fatty acid. This is found heavily inside sea buckthorn oil. This fatty acid is great for hair, nails and skin, helping to fight the aging process. Other major benefits include cardiovascular support. Omega-7 helps reduce cholesterol. All in all this is just a few of the benefits of having omega-7 which is found in very limited foods on our earth. Now depending on the ripeness of the blueberry your pudding will either be sweet or tart, and sea buckthorn berries are actually very tart in taste so if your good with tart then you don’t need to sweeten the pudding very much because you’ve just won the mother load with tat taste. The blueberry and sea buckthorn are a pretty intense taste together but with so many amazing vitamin and minerals the pros definitely out way the cons! It is very easy to assemble and you can eat it in less then 15 minutes after making it. Start by blending blueberries and non dairy milk in a blender. You can use frozen or fresh blueberries, Add about 5 tablespoons of chia seeds to a bowl and pour in mixture to your chia seeds, stir in and add I desired amount of maple syrup, set aside for a few minutes minutes. Add in desired amount of fresh or frozen sea Buckthorn berries. 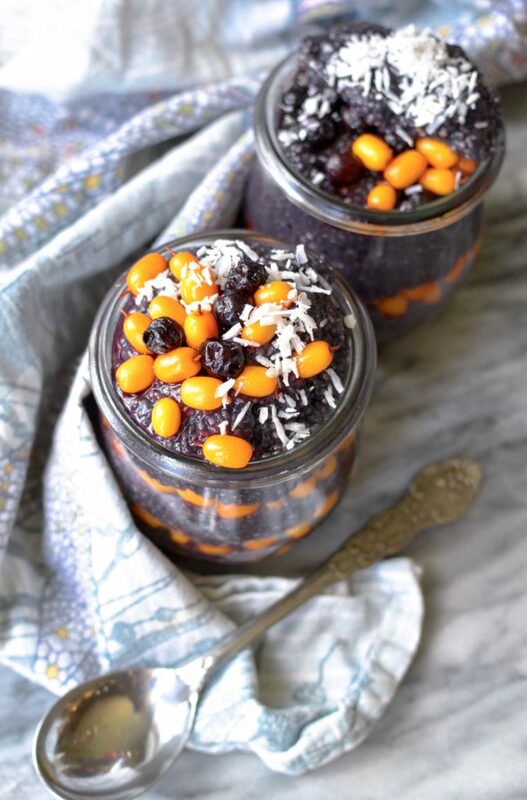 And finally serve and enjoy the benefits of this superfood pudding. if you link my stuff follow me on other socials! Facebook, Instagram, Twitter. Add liquid into a bowl and add in chia seeds stir. 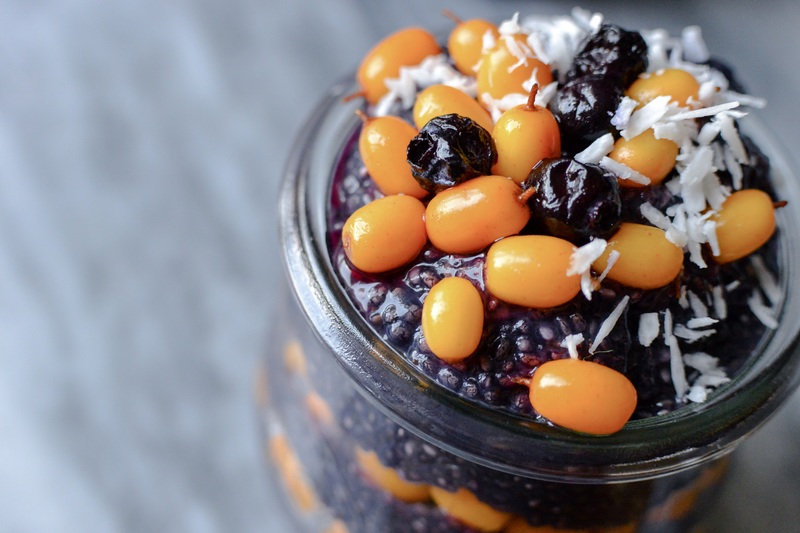 Let sit for few minutes then add sea buckthorn berries and enjoy the nutrient packed pudding! I have never tried or read about Omega 7 . Should actually try more on that! Gosh, this reminds me we haven’t gone sea buckthorn foraging for a couple of years or more. They are amazing berries, but incredibly hard to pick due to the horrendous number of thorns that surround them. Love the sound of your pudding and the colour. I have never heard of buckhorn berries before-they look so pretty! I wonder what they taste like. I’ll have to keep an eye out for them! Blueberry is one of my fav fruits of all time. I would love to try this at home! Sounds so delicious. That looks so yummy and too cool that is healthy. I also have a sweet tooth. On that looks super interesting. There are some ingredients in here I’ve never heard of! Thank you for sharing! Yummy! I’ve used sea buckthorn oil before but I don’t think I’ve ever had the fruits, sounds delicious! and of course with blueberry season right now, this is a winner recipe! I have been loving blueberries lately, definitely would love to try this recipe sometime soon! I like the Omega-7 because of its work in the help to fight ageing and the rest of it. 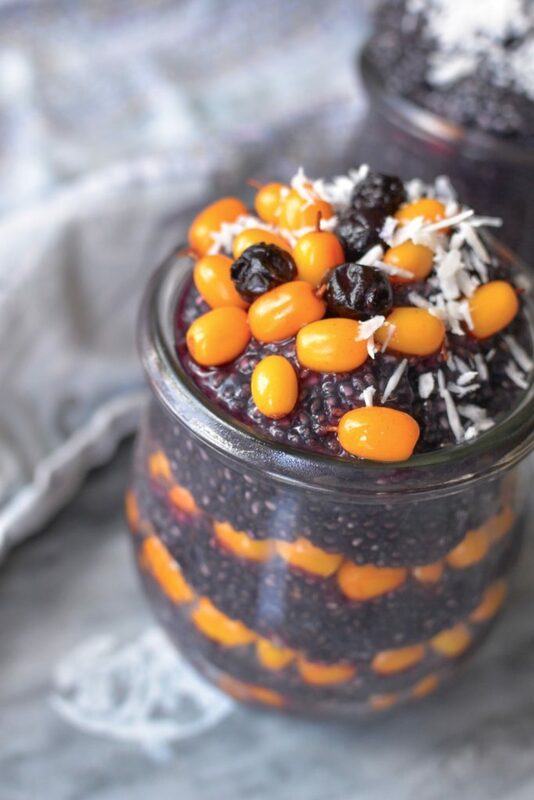 Am going to give this Blueberry superfood pudding a try.